Check out the Peacock Bass Association - click on the logo! 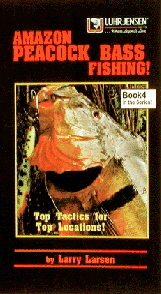 Book 3 in the series focuses on catching America's greatest gamefish, the peacock bass. It offers the latest tips on where, when and how to catch this exciting fish, including range/seasonal movements, fly fishing tips, battle tips and newly-discovered top locations in the world. Comprehensive tackle/equipment recommendations, and Larsen's secrets to finding the most productive habitats in the most productive lagoons for giant peacock bass are presented. Don't waste your valuable time learning on the water! This book and the other two have all the information you need.